and essentially (as described in this paper) corresponds to a modification of the initial model proposed by Lavalle et al. so that it becomes more consistent with the kinematics of a fixed-wing aircraft. Dubins airplane paths are more complicated than Dubins car paths because of the altitude component. Based on the difference between the altitude of the initial and final configurations, Dubins airplane paths can be classified as low, medium, or high altitude gain. While for medium and high altitude gain there are many different Dubins airplane paths, this implementation selects the pat that maximizes the average altitude throughout the maneuver. ​or have a quick look to it below. # Check if start and end node are too close. 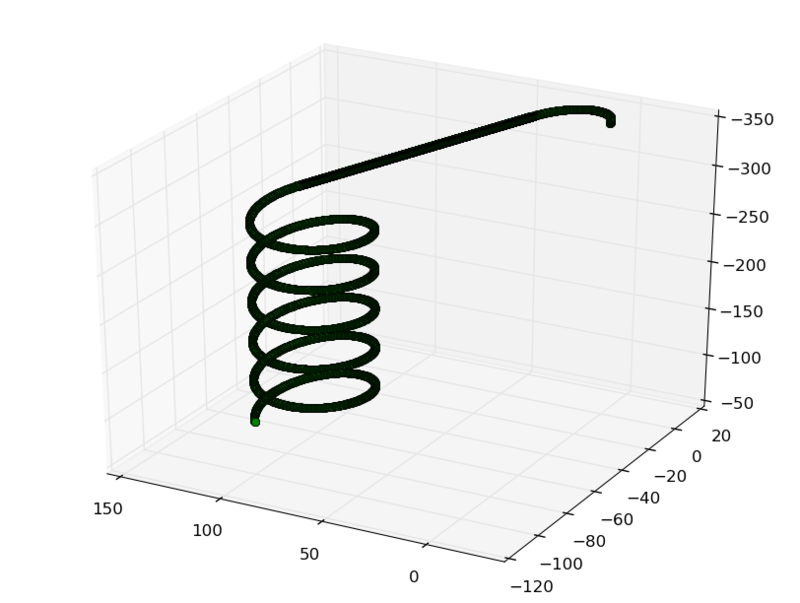 Since spiral-spiral-spiral (or curve-curve-curve) paths are not considered, the optimal path may not be found... (see Shkel, Lumelsky, 2001, Classification of the Dubins set, Prop. 5/6). Below is a conservative bound, which seems (by experiments) to assure a unproblematical computation of the dubins path. print "Conservative condition (end_node[0:2] - start_node[0:2],ord=2) < 6*R_min) not fulfilled!" print "Start and end pose are close together. Path of type RLR, LRL may be optimal"
print "May fail to compute optimal path! Aborting"
# origin is "cre = ze + R_min * np.dot( rotz( -pi/2 ), np.array( [cos(anglend), sin(anglend), 0] ).T )"
# origin is "cri = zi + R_min * np.array( rotz( pi / 2 ), np.array( [cos(anglinter), sin(anglinter), 0 ] ).T )"